Laying styles are referring to the pattern of lining tiles up next to each other on your wall or floor. Straight (or stack bond) – which is the most common, just normal tiles in line. Diagonal – Simply tiles in straight formation, on a 45-degree angle. Herringbone – One tile vertical, next tile horizontal (usually done on 45-degree angle). Basket Weave – Double vertical, double horizontal. Windmill – Make squares with cut tile as centrepiece. Pin Wheel (hopscotch) – 45-degree angle, offset with cut tile in between. Stretcher Bond (Brick/Subway) – One layer offset slightly from layer below. Introducing specialist patterns into an area is a way to turn areas into a miniature feature without introducing bold or clashing colours. Doesn’t necessarily have to become a feature. If using plain white gloss with a more simple pattern, such as horizontal brick, the style becomes enough to make an area more lively, without standing out too much. Using a pattern can open areas up, making smaller spaces appear visually bigger. It does this by masking the straight up and down/sideways lines and makes boundaries less distinguishable. This effectively helps to disguise the end points. Straight pattern is most common for floor tiles. Horizontal block pattern is the most common application for wall tiles. Tried and true, safe option. 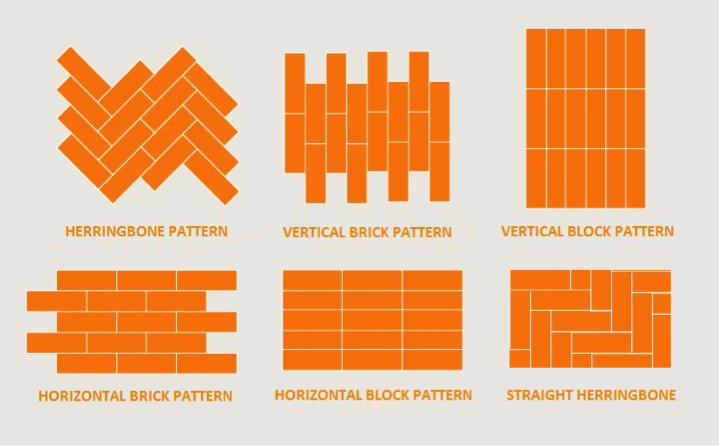 Horizontal brick pattern is most suited to classical architecture. Not all laying styles will suit all tiles. Some patterns, such as herringbone, may not be viable with certain size and shape tiles. Always lay down loose tiles in the pattern you desire and visually inspect the design before laying.